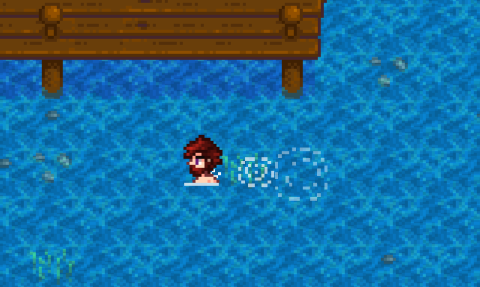 It's summer in Stardew Valley. You've just spent an afternoon fishing on the lazy river that plods through the backwoods. You spent the morning gathering seashells over on the coast and now it's time to relax. Perhaps at some point during these activities, you thought to yourself "It sure would be nice to jump in and cool off!". Well, with "Swim (Almost) Anywhere" that's possible! The mod still has a few (very minor) issues, namely in the form of invisible barriers, but that shouldn't stop you from swimming (almost) anywhere. If you are on this site, playing a game published by Bethesda, there is about an 87% chance you've had to use the console at some point - be it for taking screenshots, adding items to your inventory, or getting yourself unstuck from a wall. In Fallout: New Vegas this can be a difficult situation. As the game takes place in the desert, the ambient light is very bright, and the text on the console can become almost invisible unless you purposefully point the crosshair to something dark beforehand. 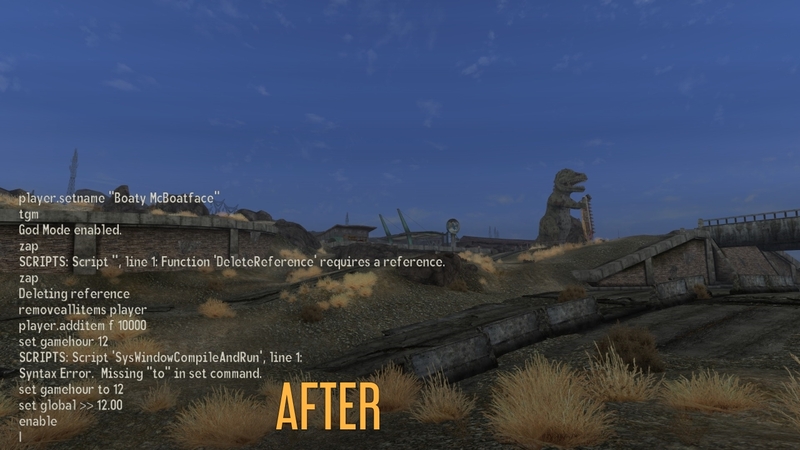 Ladez's Console Background is a perfect, elegant and lightweight solution to the issue. It applies a slight dark tinting to the screen whenever the console is enabled, making the text much easier to see. The opacity can be tweaked to suit individual tastes easily through the console, although the default values are really good so it isn't strictly necessary. And, being such a small mod, it can be easily be merged into other esp files to save a load order slot. I cannot play without it anymore! As the name suggests, this mod aims to add more companions to The Witcher 3. While there are several alternatives which accomplish this in different ways, this mod organically scattered these characters around the map who can recruited by simply having a quick chat with them. 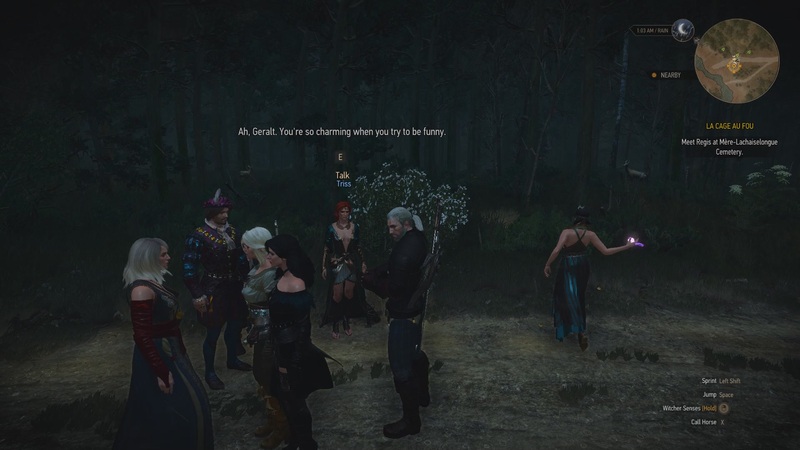 Also unique to this mod is that as followers Ciri, Yennifer, and Triss have all even been given some bits of custom dialogue, which is a very nice touch. The others you may recruit will simply use generic dialogue to acknowledge your request, which also gets the job done just fine. In addition to these 'special' companions described above, many more are available to be spawned via console commands with this mod. Not only does this include humaniods but also various creatures as well, each with different strengths, weakneses, and abilities. Fancy an entorage of wolves, bears, or even wyverns on your journey? Go for it! With some exception (see the description), you can have as many of these companions as you like and they will follow you indefinitely. This can lead to some rather large and spectacular battles. Much of the fun I've had so-far with this mod has been simply experimenting with the capabilities of the numerous companion types offered. While great at any time, this mod especially helps the end-game from becoming lonesome. By offering immersive in-game dialogue options as well as the freedom of new console commands, it has something for everyone making it easy to recommend. Thanks Jamezo97! While technically an armor mod, it also makes for a great immersion mod - and this particular one has always been a favorite. Silt Strider Armor does far more than simply give the player a fantastic new set of armor - the mod also places two Ashlander guards to each Ashlander Camp, with each guard carrying a unique version of the Silt Strider Armor depending on the camp they're in. 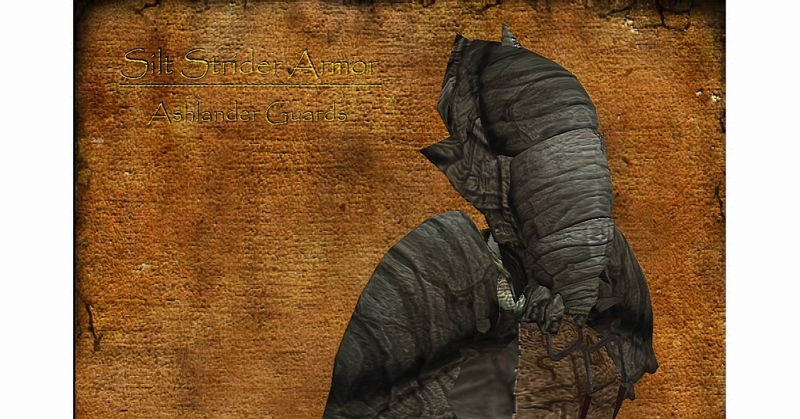 Not only will the guards of Erabenimsun, for example, wear a variation of the armor that displays their tribe's banner, but their Silt Strider set will also reflect their ferocious reputation as a warrior tribe - the Erabenimsun Silt Strider armor has a higher armor rating compared to the other tribes. Whether you want to wear the armors for yourself, or simply enjoy watching the new Ashlander Camp guards stroll around in their Silt Strider set, this mod is a great addition to the game. Additionally, I just wanted to add a quick reminder that you can pick up all of these games, DRM-free, from our friends over at GOG.com! Just thought I'd point out that these latest two news posts aren't showing up in the individual games' news lists. Would be cool to have one staff pick per main game, and then honorable mentions for other games like Stardew valley. I only ever look for Fallout 4 picks haha. What exactly do you mean by "main game"? Games with more frequently put out mod content. Is everything okay at Nexus? We haven't seen a post from you guys in a month. Just busy testing the redesign as well as some holidays mixed in. We'll be back soon with more picks and updates. Promise!